NH's premier creative/technical networking event, ebrew, is rebooting through a partnership with NH Tech Alliance and the Chamber Collaborative of Greater Portsmouth. Ebrew was started in 1999, making this the 20th year anniversary for the event. After a bit of a hibernation, the Portsmouth-based monthly networking event for technologists and creatives, Ebrew, is coming back! The casual event is a place to meet peers, share stories and opportunities, and relax after a days work. Ebrew is held on the first Wednesday of every month from 5 to 7 pm at The Press Room. These events are free and no pre-registration is required, just show up and hang out! 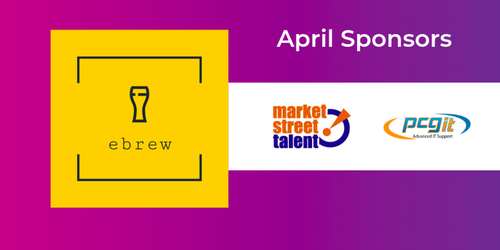 Thank you to Market Street Talent for being the Series Sponsor of the 2019 Ebrew events and Portsmouth Computer Group for sponsoring April!